Sediments at the bottom of deep sediment basins may achieve a few hundred degrees Celsius. The entrapped water aids in the metamorphic process and provides a means to achieve chemical recrystalization. These metamorphic materials closely resemble the texture of their original parent materials as there is little mechanical deformation. The primary minerals which represent this process are zeolites. These are minerals with complete silica polymerization, but containing trapped water. Hence they have chemistries consistent with the feldspars, but their structures are hydrous. This type of metamorphism occurs in deep trenches along tectonic margins. Regional metamorphism involves large amounts of differential stress and chemical recrystallizaton. The resultant products tend to be distinctly foliated. They are found in mountain ranges or remnants of mountain ranges. So one might ask ... what causes a mountain range? The answer is tectonic uplift. Hence, regional metamorphics are the result of the titanic energy in subduction or collision zones. The slate, phyllite, schist, and gneiss are common regional metamorphics. 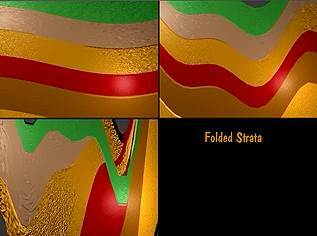 When strata is folded due to compressional force, some is pushed up and some down. Even a single layer containing the same rock composition my be laterally separated by the folding. The material higher up will see different pressure-temperature gradients than that pressed down. Because of this, the same starting materials may yield different metamorphic rocks. This has been studied and a series of rocks are now known for different conditions. By studying the ratio of certain common elemental compositions it is possible to determine a history for virtually an metamorphic rock. The ratios of SiO2 to Al2O3 to CaO (silica:alumina:lime) are approximately fixed throughout the world in most metamorphic rocks. The mineral species present change, but the overall chemical ratios stay much the same. If the ratios of the building blocks stay roughly the same, then the exact minerals found must be related to the pressure and the temperature. This was proposed by Pennti Eskola in 1915. This relationship is known as the metamorphic facies. Since he studied mostly basaltic rocks he named the three series after basaltic minerals assemblages.